I finally have my own craft room (I’m house-sitting for six months) but sadly I’ve been experiencing a creative drought. Possibly burned out after making over 300 handmade holiday cards in November and December. 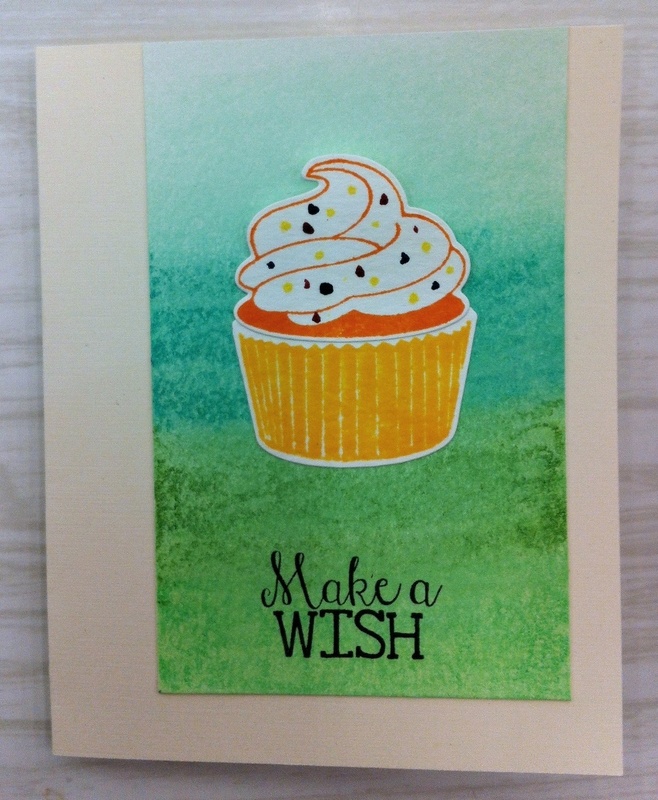 I used a technique I saw online by Damask Love, where she scribbled Gelatos across a piece of paper and then used a baby wipe to blend. Although this card was made a year ago, this still remains one of my favourite ways to create a fast and effective background for a card. Dylusions Spray Inks (cupcake ‘sprinkles’). 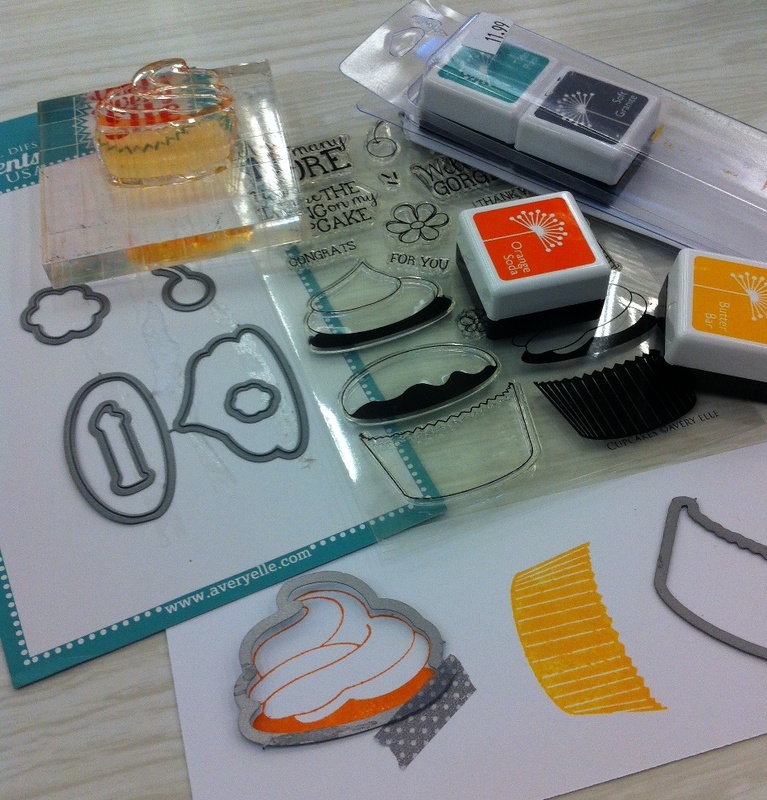 Cupcake die-cutting in action above… a little washi holds the die in place for perfect cutting. I’m one of those nuts who actually loves to fussy cut so I don’t have very many stamp & die combos. What drew me to this one in particular is that the shapes can also work on their own without the stamps, a big bonus in my books. 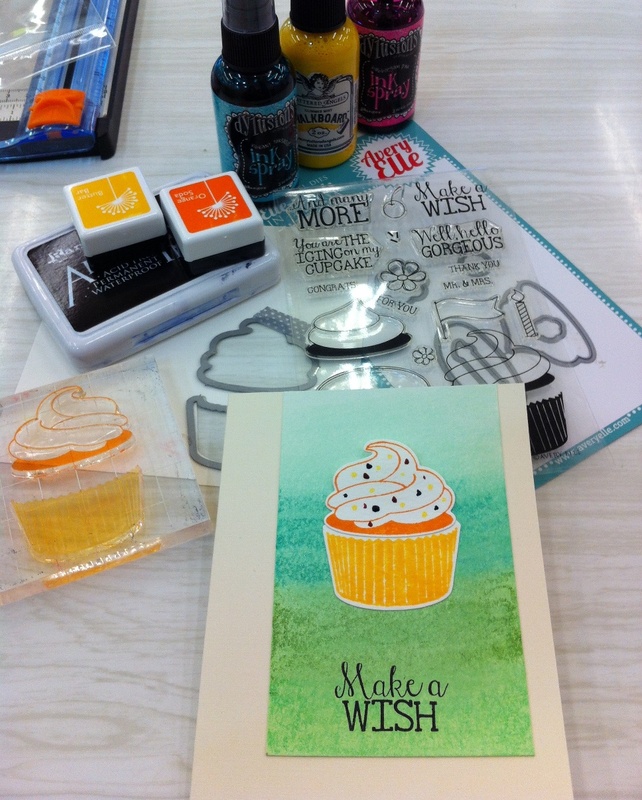 I have a little weakness for cupcake stamps and this is one set I could not resist. Happy Labour Day, I hope to pop in here a little more often with cards that are much more current… we’ll see how it goes! It’s been awhile, I’m sorry blog-land. I’ve been having a little fun with watercolor paints lately, and while I was at the Paperie Scrapbook Retreat one short month ago I had a LOT of fun with my Twinkling H20 paints. I actually hand-painted these pretty little flowers and I was so proud of myself (maybe too proud). I was just fooling around with paint on some scraps of watercolor paper and was so pleased with the outcome. With a Hero Arts sentiment, it turned into a perfect thank you card. My next card was my favourite of the two. Again, I just fooled around with my Twinkling H20 paints and painted these pretty pink flowers. Once I added my Hero Arts sentiment, I decided to add a few dots to the flower centers with a black Pitt pen to tie in the black. I also made a matching envelope for this card, which is something I really ought to do more often while I still have all the supplies on my desk. Now if someone could just teach me how to take a decent photograph, these cards might be more impressive. To me, they’re very special and I can’t see myself ever giving them away. But recreating them? Absolutely! I shared both of these cards on The Paperie blog for our May card kit release (there are still a few kits left – call 726-5323 to snag one for yourself). The pink Twinkling H20 paint came in my kit and the rest of the supplies came from my stash. I can’t wait to play with the July kit – that is my next task! I’m going to challenge myself to start making 5 cards a week for the next two months. While I can’t promise that I’ll share all the results here, I hope I can at least stick to this goal and start creating more clean & simple cards. It’s not 2014 yet, but I have a new years resolution to start blogging more often so why not start now? Every second month or so I’ve been designing for The Paperie’s Card Kit, so I thought I’d share my most recent cards from the December kit. I’ve already posted this over on The Paperie blog so if you’ve seen it feel free to skim. I loved the birch patterned paper in this kit and I had some new 6×6 Scor-Tape sheets to try, so I borrowed Stickles Dry Glitter from my co-worker, Tina. 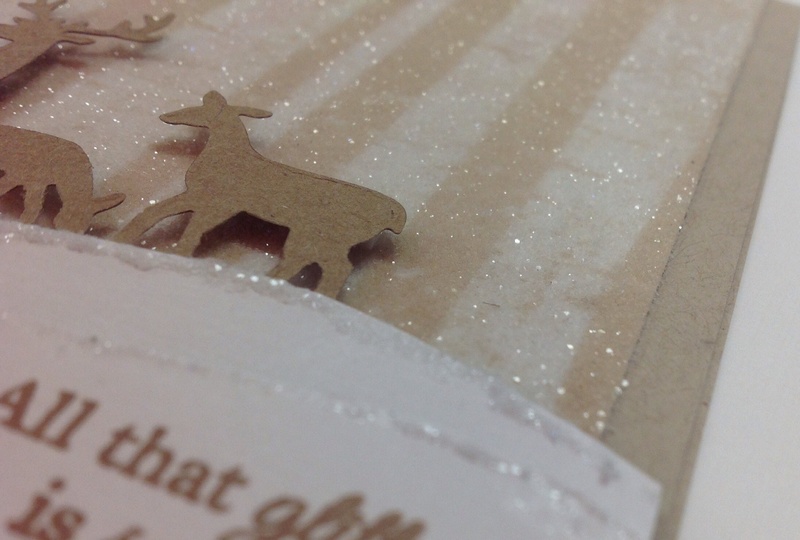 I also borrowed the ‘Winterland Deer’ die from Wendy, owner of The Paperie. It’s always fun when you get to share supplies with your co-workers and discover new ways to use older supplies! 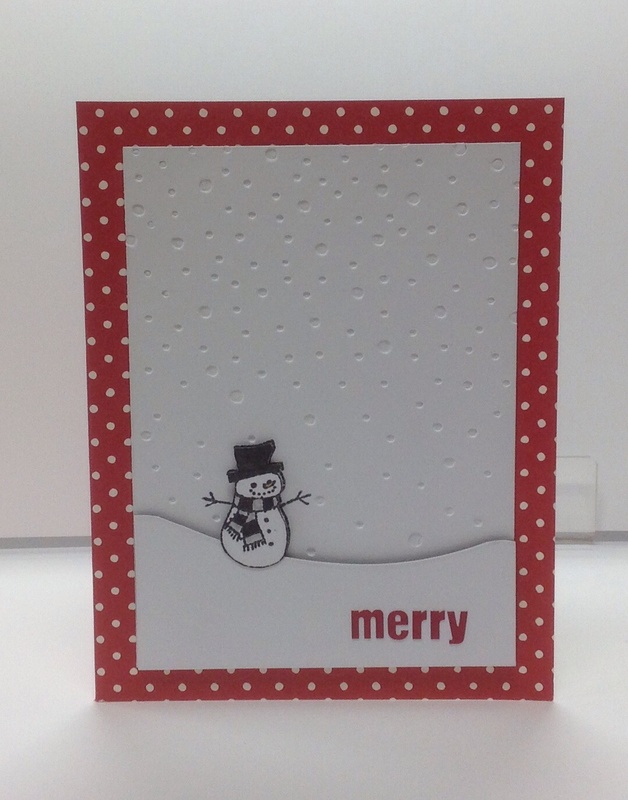 I used the Hero Arts Falling Snow Embossing folder with a panel of white cardstock to create the debossed snowy background, then stamped my snowman. I also stamped the snowman on a tiny scrap of white cardstock and cut out before colouring which is popped up over the background snowman. I bought the Snowdrifts die from ‘My Favorite Things’ to die-cut the snowbank from another scrap of white. The sticker letters finished off the panel, which was mounted on the red polka dot card. For this quick card I stamped the snowglobe on a scrap of white and stamped the tree inside, coloured the whole thing and added a big of glitter to the snowglobe with Zig fine-tip glue. This was all popped up on the green scrap of paper with foam tape. The sentiment is just one of the stickers in the kit with two pearls on either end – pretty easy! 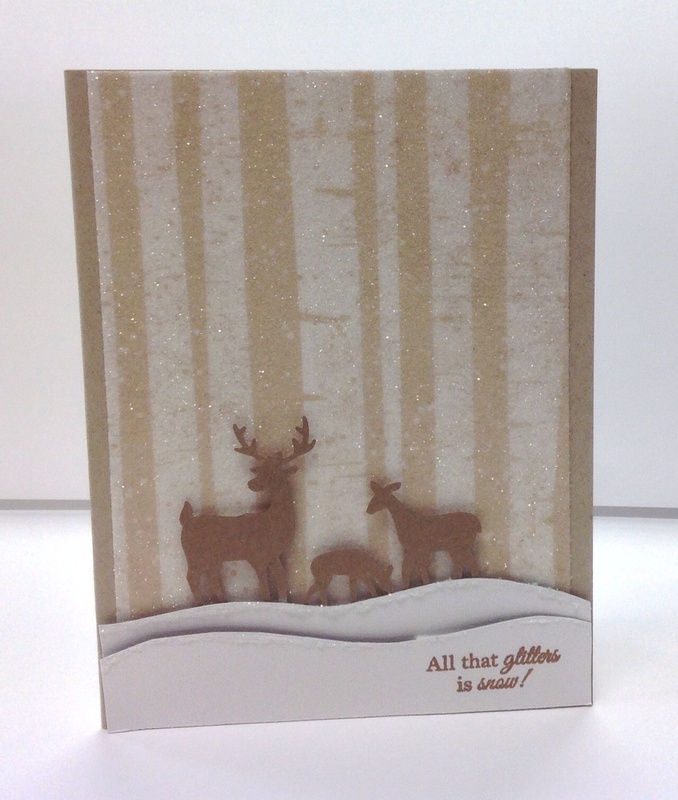 I used the cream cardstock in the kit for this card base and a panel of the woodgrain cardstock which was distressed with Pinecone VersaColor ink. I had a pile of branches die cut on my desk from a previous project, so I stuck that on the card and added some pearl ‘berries’, and a sticker sentiment finished it off. 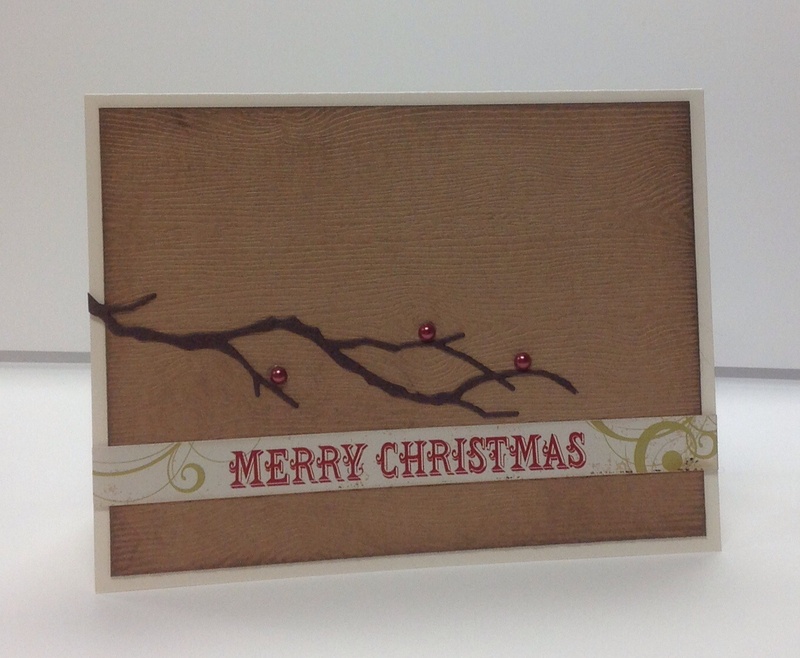 Here’s my other woodgrain card which I wanted to keep extra simple. The only things I used here: my Hero Arts Christmas Words embossing folder, VersaMarker to highlight ‘Joy’, and some twine from the kit. This will be the perfect card to give to one of my brothers or my dad. 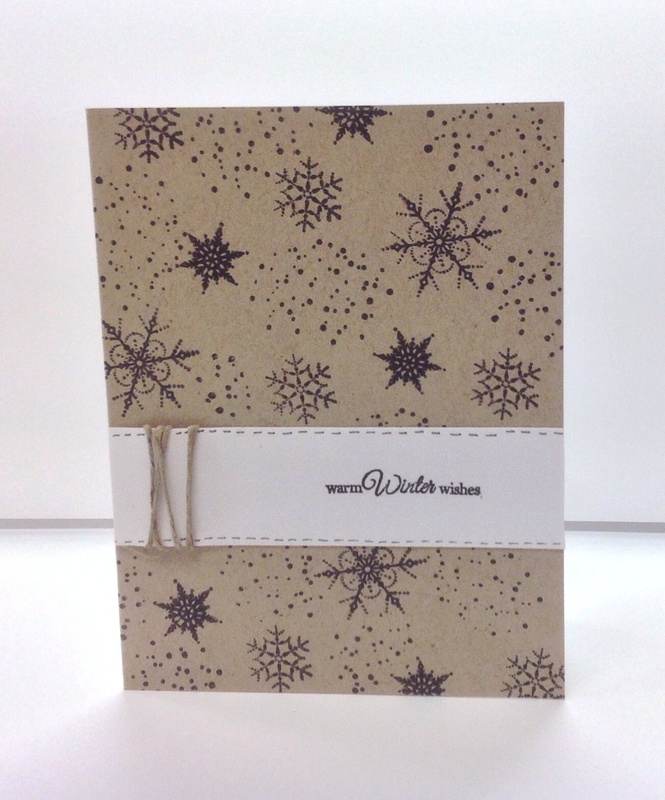 Another simple card with a kraft card base stamped with the snowflakes and snow speckle stamps in black ink to create a random pattern. 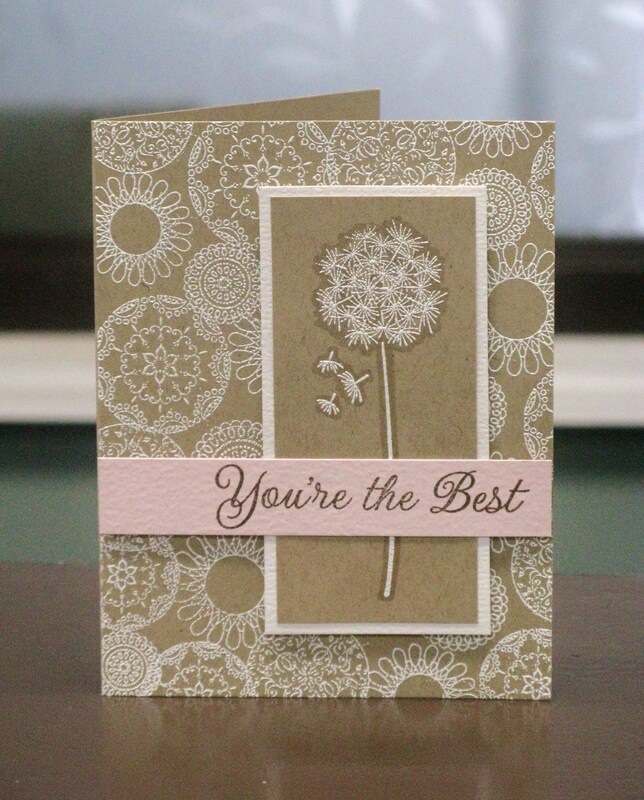 A scrap of white cardstock stamped with the sentiment and embellished with twine and faux stitching adds a finishing touch. 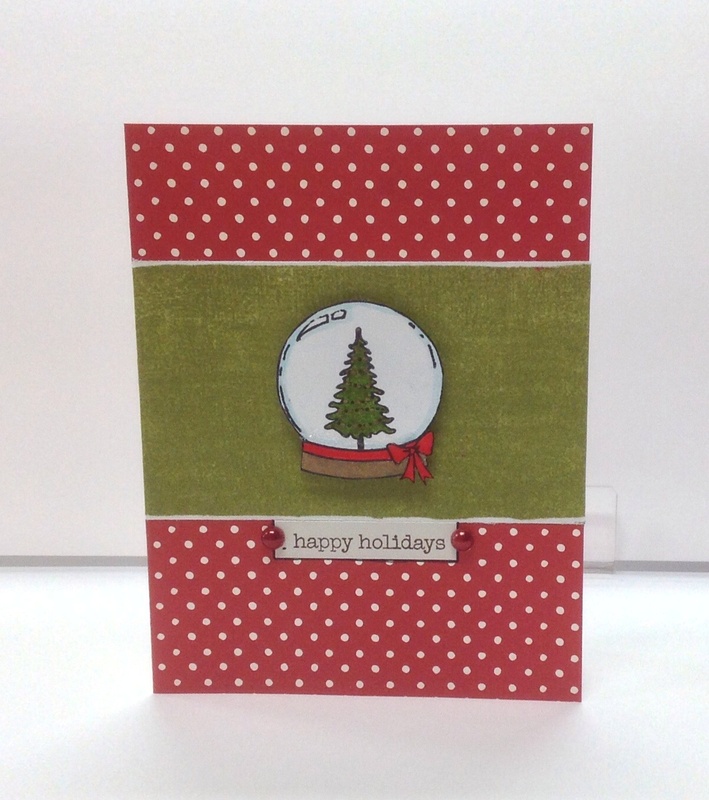 I have a little basket of card bases prepped and ready to go on my desktop, so I used one of my own kraft cards to make this quick and simple card. 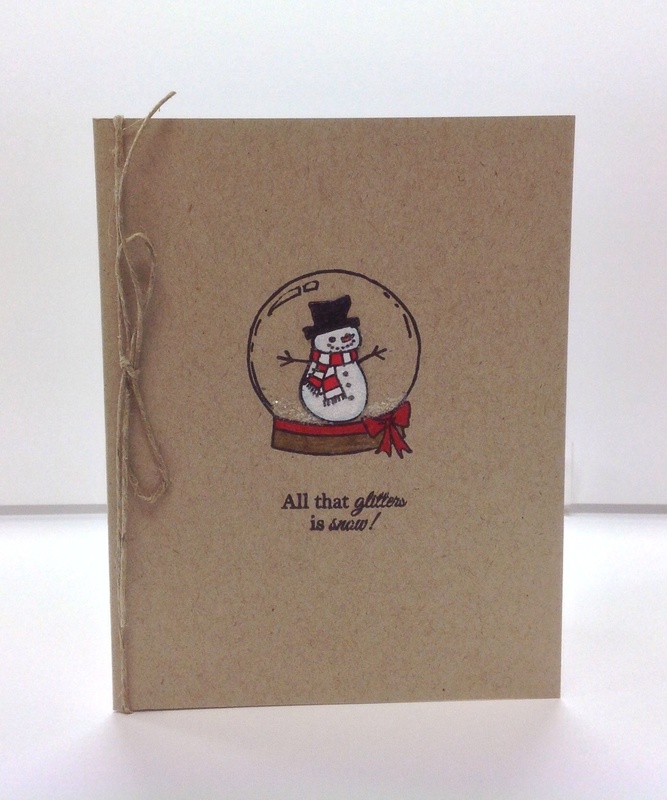 The snowman was stamped inside the snowglobe on the kraft cardstock, then stamped again on a tiny scrap of white cardstock, fussy cut, and placed inside the snowglobe with flat adhesive. I loved the kraft snowflake cardstock in the kit and didn’t want to cover it up too much, so I adhered the panel to the white card base and added a strip of Scor-tape that I had leftover from my first card to adhere a strip of glitter. 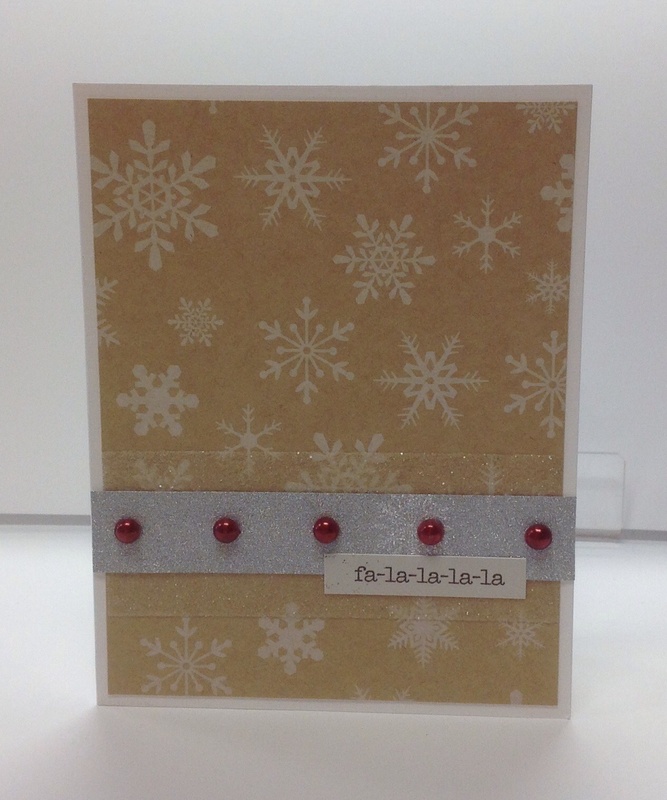 The silver snowflake Pow Glitter cardstock was added with some pearl accents and the ‘fa-la-la-la’ sticker. This moustache stamp was from an older Paperie card kit; it was simply embossed in white on the red card base, then I die-cut a Lawn Fawn ‘Say Cheese’ polaroid frame to accent Santa’s little moustache. The sentiment was handwritten – I made this back in ‘Movember’. 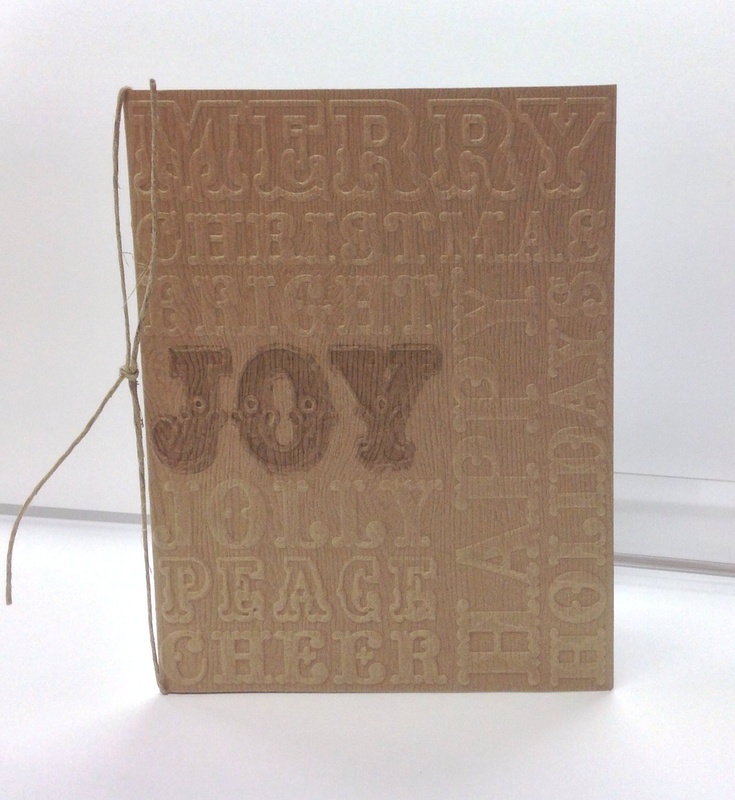 There are still some December card kits in stock at The Paperie, so be sure to call 726-5323 to reserve one for $24.99. It’s been awhile, little blog. Does anyone still read this? According to my blog stats, I get a lot of views thanks to this embossed vellum card which is wildly popular on Pinterest. Everytime I check this page my heart does a little song and dance. I was planning a few little pins for our Paperie Pinterest board and I couldn’t find these cards I made a few years back on either this blog or The Paperie blog. Time to rectify that! These two cards are oldies but goodies using some older Hero Arts floral stamps. Both of these cards feature two of my favourite things, VersaMark Pen and the White Uni-Ball Pen. 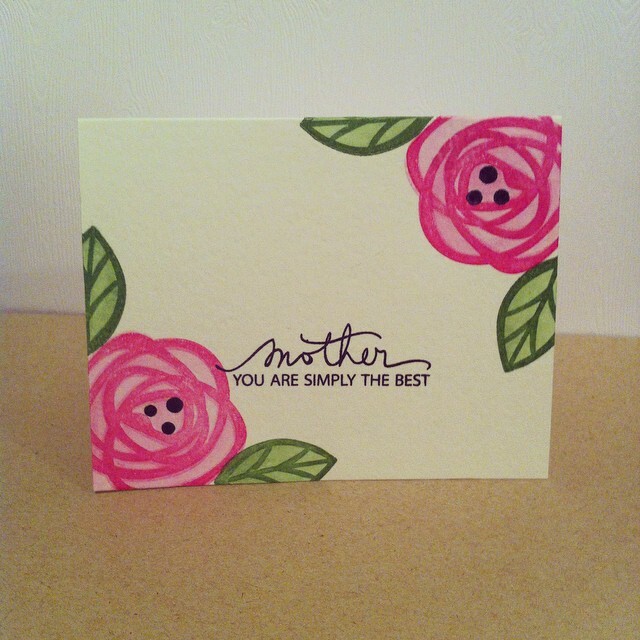 For the card above, I stamped the same floral image in two sizes on the kraft card base using Rich Cocoa Memento Ink. 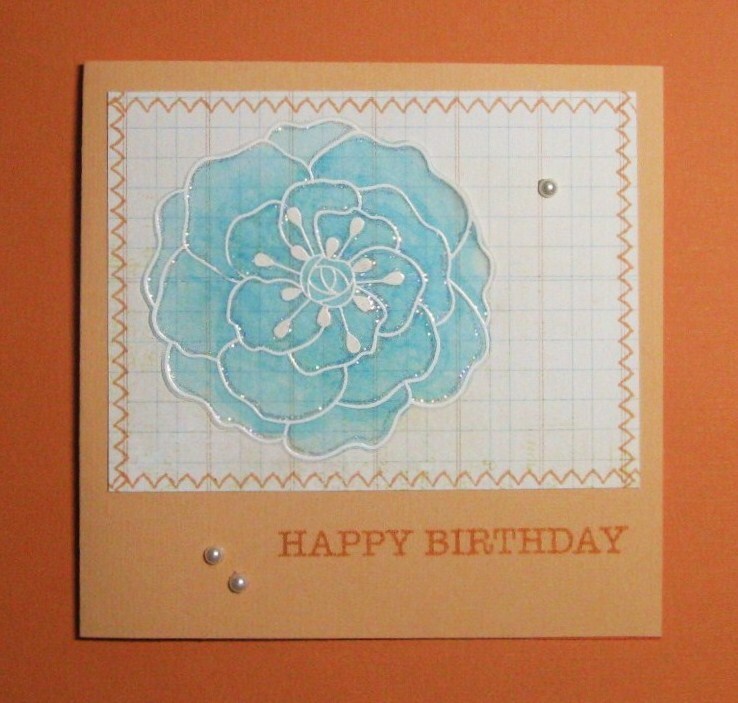 I also stamped the larger flower on a scrap of white cardstock and a scrap of pink cardstock, and cut out the two layers popping them up on the card with foam tape. 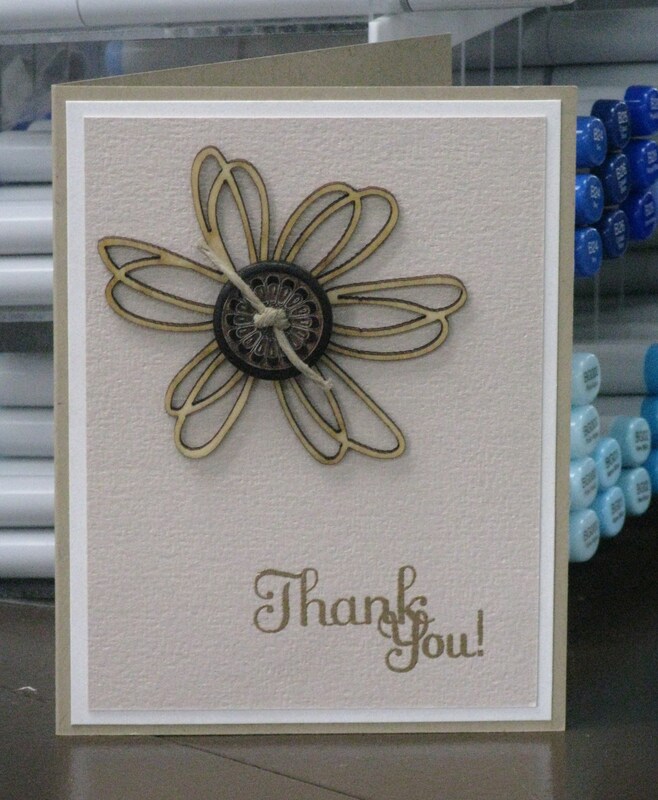 I used a VersaMark Pen to outline the brown flowers on the kraft cardstock and shade the centers to make them pop a little. The white border was cut from an AccuCut album borders set. The second card is a longer card which fits in a business size envelope. This might just be the only card I made in this size, but I liked it so maybe I’ll try again someday. Again I repeated another Hero Arts floral stamp in Rich Cocoa Memento Ink on Kraft cardstock and shaded the centers and outlines with VersaMark Pen, accenting with my fave White Uni-Ball Pen. 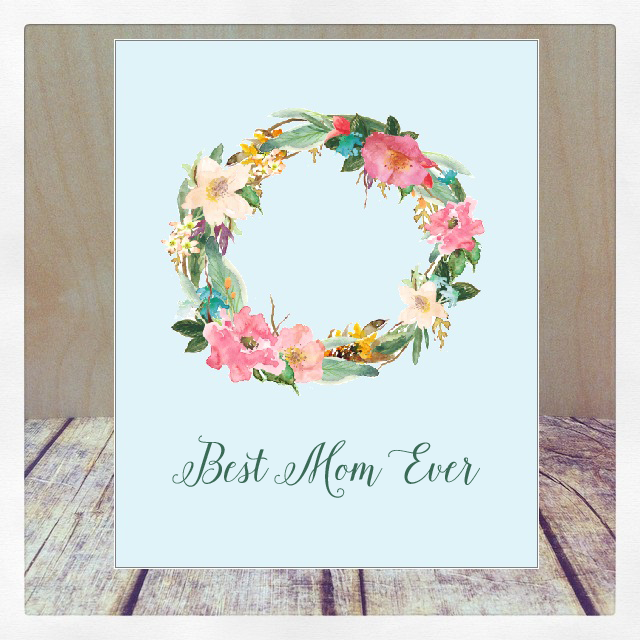 The focal flower was stamped three times on pink, blue and orange cardstock and cut out the three layers of each stamp to create a multi-color flower. 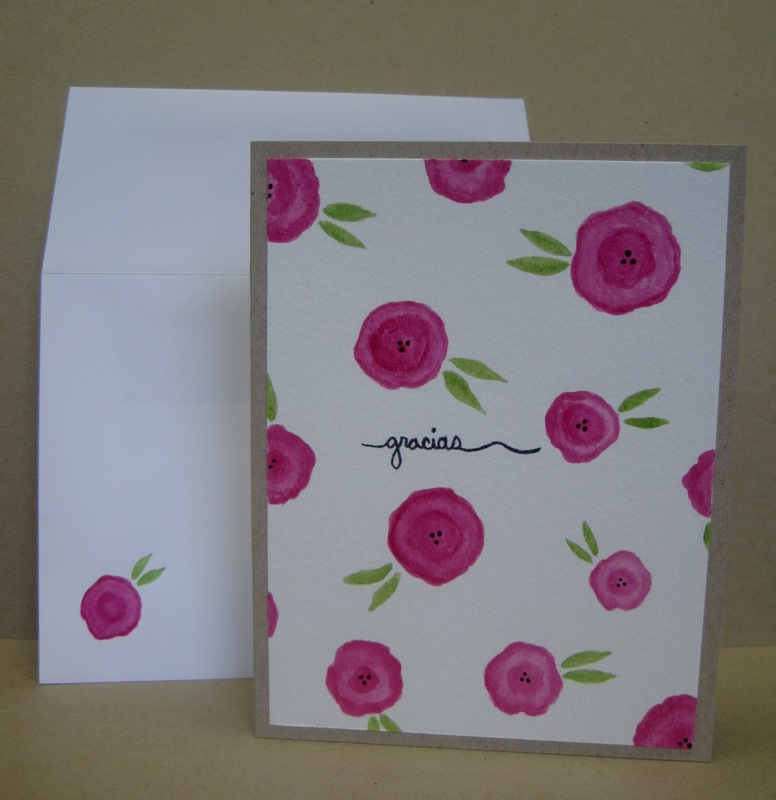 Love these notecards that Amber made on the Damask Love Blog with the VersaMark Pen – check them out! You should play along too if you have a chance. Hey! Just noticed that my first card vaguely resembles this sketch. I’m planning a little Spring Florals card class for May at The Paperie, perhaps I’ll use this sketch as inspiration for the first card. Stay tuned! Hello everyone! Today I’m sharing the Christmas Card I was planning to send out to everyone this year. Sadly, I only made 12 cards. So instead I will share this card with all my far-away friends virtually and hopefully you will know that my intentions were true. I am the worlds worst procraftinator. I wish I was capable of taking a decent photograph – my apologies. This card was all about favoritism. I used my favorite stamp set, Jingle All The Way by Ali Edwards for Technique Tuesday, along with my favorite product (and colors) Twinkling H2O’s shimmery paint, and bling! Love bling. Gotta have it. One favorite thing I did not use was foam tape… this one layer wonder did not need it. I actually enhanced this card slightly for the people who received it this year by adding the white panel to a green card base but I like it either way. Anyhow, hope you have a wonderful holiday! There is nothing I love more than Clean & Simple Christmas Cards. This is my favourite time of the year to make cards, and although I don’t have a lot of time for it these days I thought I would share a few cards I made in October. I taught a class that featured one of my very favourite Christmas stamp sets of the year, Technique Tuesday’s Ali Edwards stamps “Jingle All The Way”. I love these sentiments so much, the mixture of fonts is perfection and the verses work for both the inside and outside of cards. 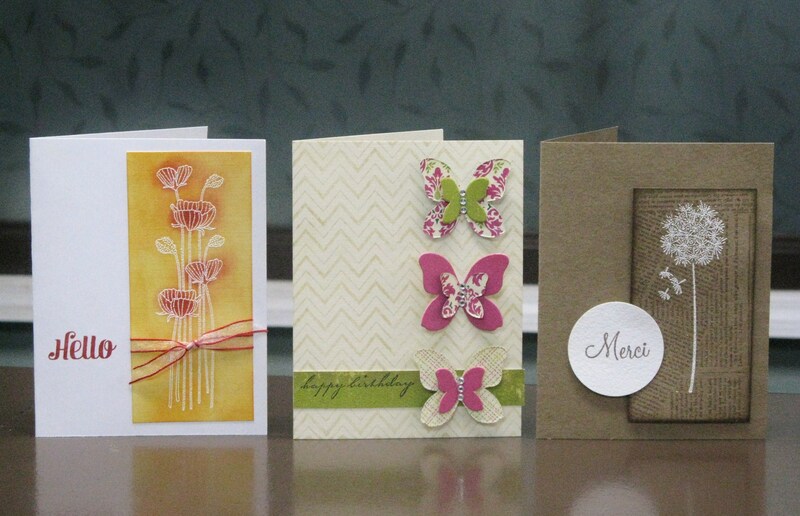 Here are three of the seven cards I made for my class, plus a tag I made for a fun Paperie tutorial. 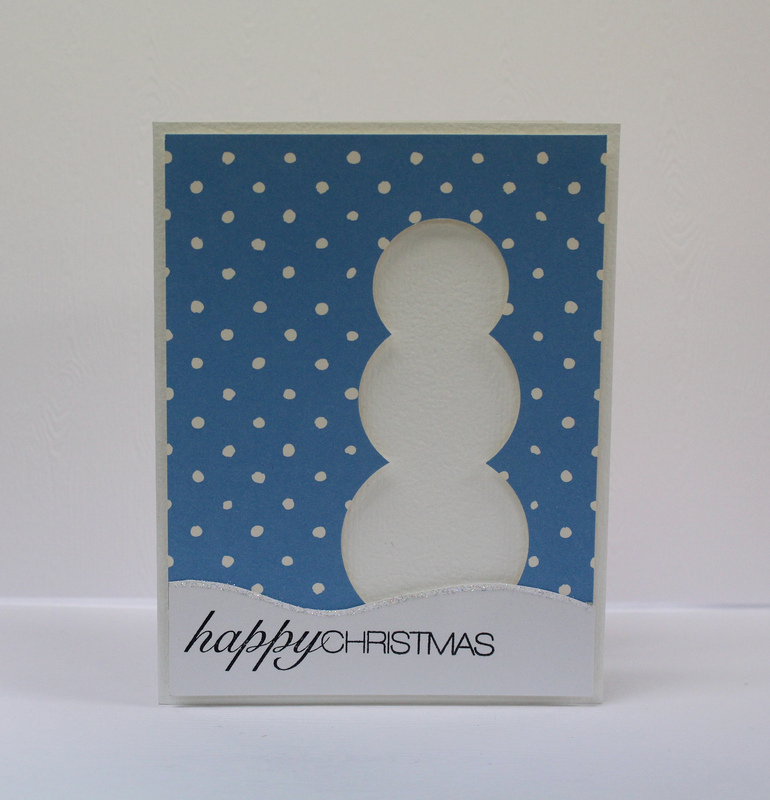 The first card was created simply with some patterned paper and three circle punches to create a snowman window. 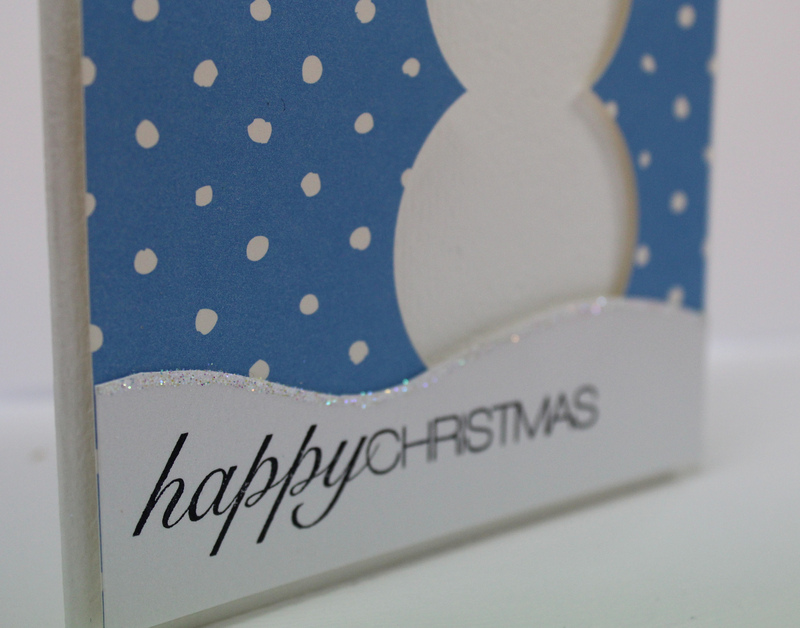 The blue panel is popped up on the white card base, and a line of glitter was added to the shimmery white snowbank. Julie Ebersole would call this card a 5MQ (five minute quickie). She can get away with saying that ‘cos she’s so darn cute. The branch is a die-cut from Impression Obsession, and the sentiment was stamped below and connected to the branch with a line. I even used a ruler. 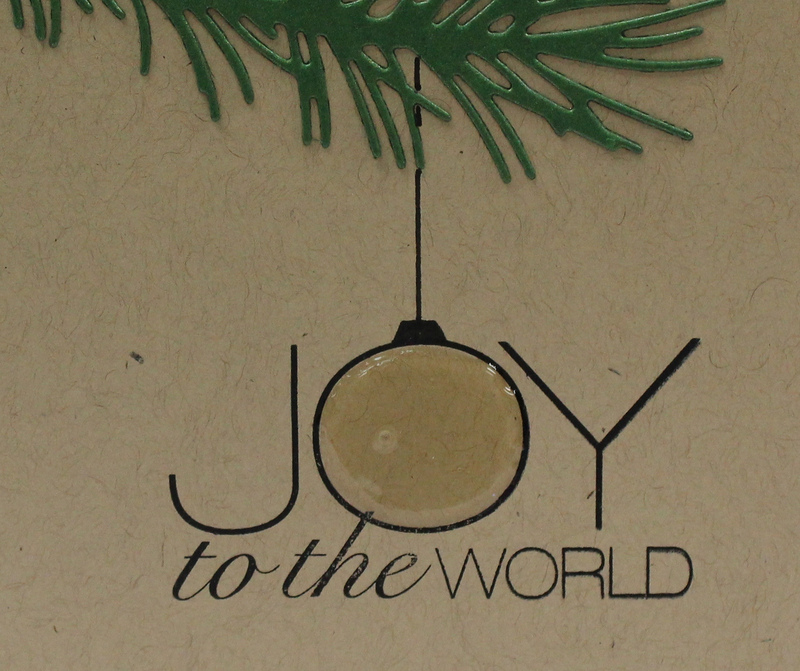 I drew a “bulb topper” for the “O” to make it into an ornament and applied glossy accents for that dimensional look. 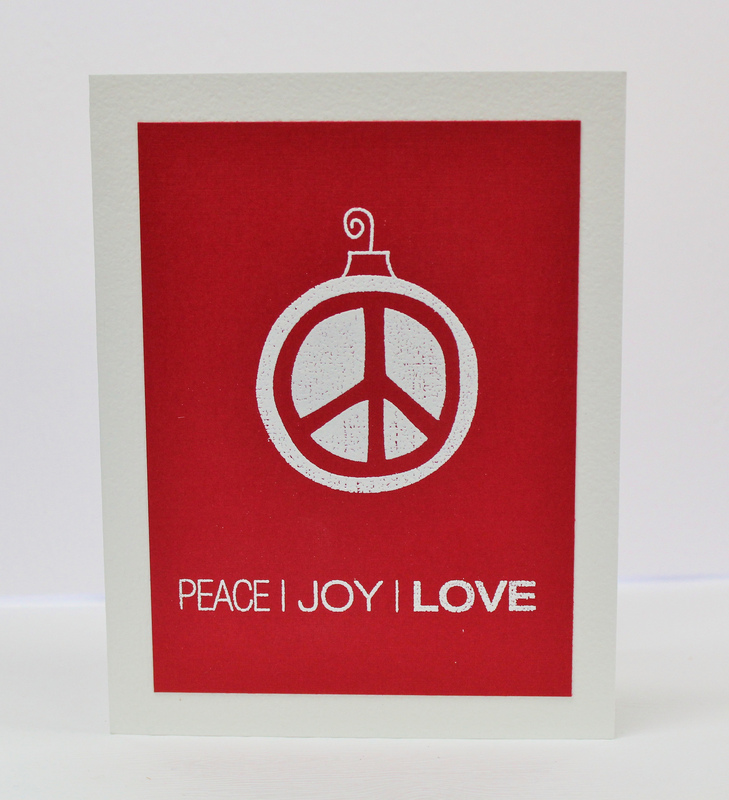 This red and white card features the Hero Arts Peace Ornament and the Technique Tuesday sentiment embossed in white on a red panel, which was mounted flat to a white panel. I overcame my obsession with dimensional foam tape for this quick two-layer card. 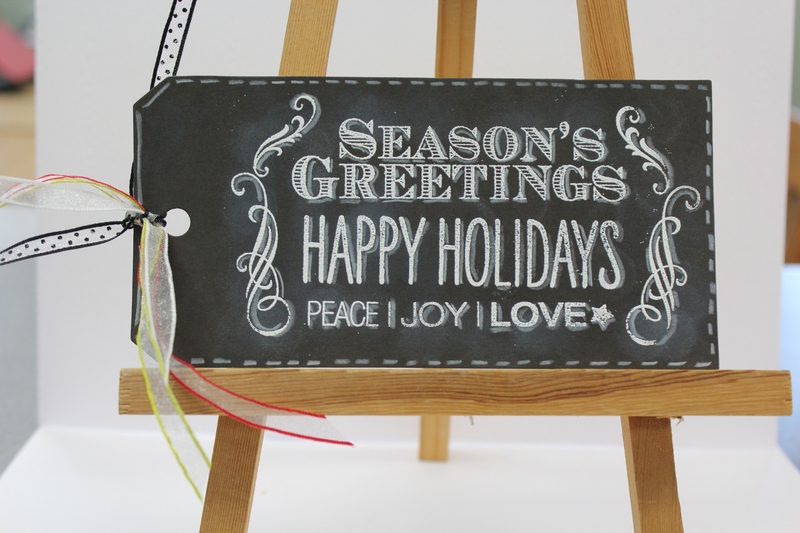 Here’s a tag I made for The Paperie Blog, inspired by an amazing faux chalkboard card tutorial by Betsy Veldman. This tag features sentiments by Hero Arts & Technique Tuesday, the flourishes stamps are from Technique Tuesday’s “Joy to The World” stamp set. I used a white pencil to outline all the sentiments (embossed in white), and a sponge dauber with white chalk ink to create the look of an erased chalkboard. That’s all for now, just wanted to check in and let everyone know I was still alive and crafting, even if it is sporadic. 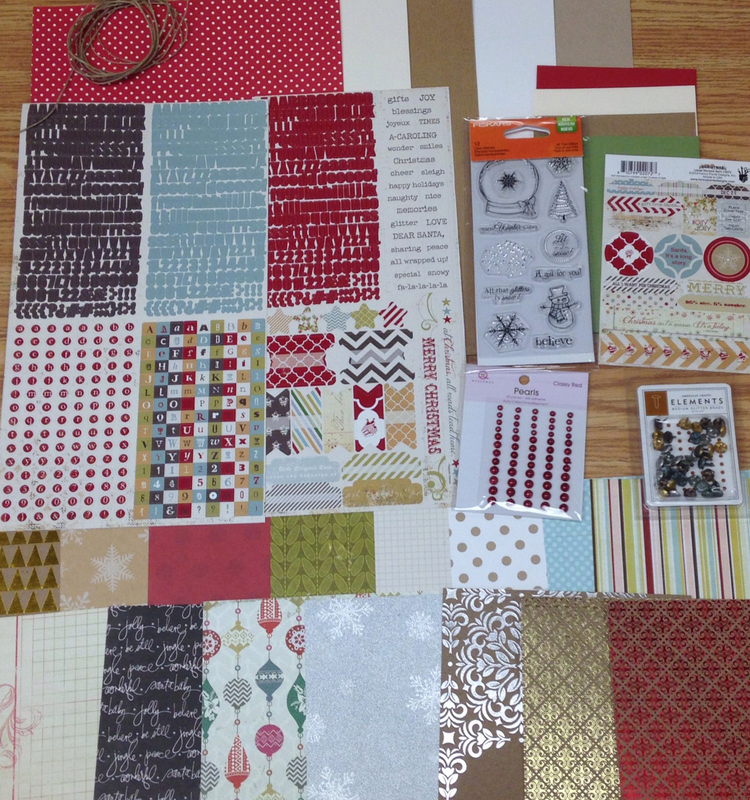 I could not resist this weeks Washi Wednesday challenge on the Freckled Fawn blog (I am Doe). You get a $5 Freckled Fawn gift certificate just for playing along! I made this “E” shaped shelf in ninth grade woodworking class. When I drew up the plan, my teacher said that this shelf couldn’t work. I wouldn’t accept that, so I made it anyway – now 18 years later I still have a sturdy little shelf. And lookie there – the edges are all the perfect size for washi tape! I used the Aqua Airmail tape from Freckled Fawn all around to dress it up. I was tempted to wrap the entire shelf in washi tape… but… I’m still at the hoarding stage. Miiine. My precious. My kitty milo popped in during the photoshoot to sniff around. He loves to play with washi tape, so I keep it safely stowed in a clear cracker container. Do you like my silver ampersand? I have a green one too… I was going to keep one at work and one on my desk at work, but Sara suggested that I start collecting them. Oooh! I must buy a wooden one and cover it in Washi Tape! I have the weekend off, and am planning to hit up some more antique stores. I’m on a quest for old aqua Ball Mason jars. What are your plans for the weekend? In November I rescued a beautiful ginger cat from Humane Services, and he has really turned my apartment into a home. He’s about a year old now and he is SO playful and just plain funny. 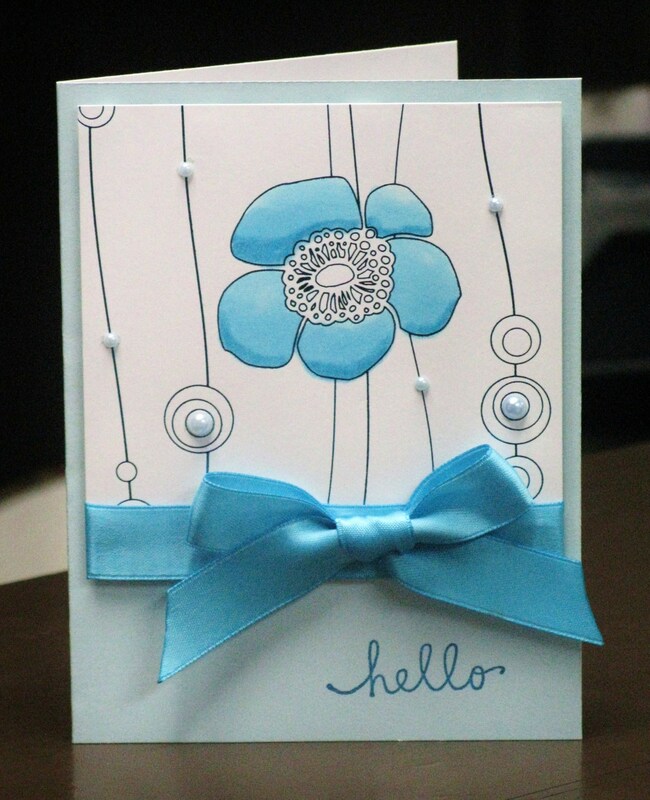 Just popping in quickly to share a card that I made two weeks ago for the Winter Blues Challenge over in the Moxie Fab World. Life has been pretty busy lately, between working at The Paperie and helping my co-worker design her business website. I really wanted to play along with this week’s Tuesday Trigger as well, but time escaped me. I found this gorgeous SEI paper in my stash, it has to be at least three years old. The image and lines are all a dark teal foil, and it’s stunning in real life. I simply cut a square of the patterned paper, coloured one of the flowers with my Copic markers. This was one of the easiest cards I’ve ever made, the sentiment is the only stamped part. Perhaps I’ll sit down at my desk and see if I can come up with anything for the Tuesday Trigger challenge, I just loved the inspiration photo this week. I’ve been making lots of cards in the last little while, here are three that I blogged about over on The Paperie Blog.. I have the weekend off so I’m planning to hunker down and actually play along with some challenges, as that’s always a good way to get the creative juices going. I think I’ll start with the Moxie Fab Tuesday Trigger and maybe then the Hero Arts monthly challenge and who knows what else. One of my resolutions this year is to spend more time crafting and less time watching tv. Failing that, as I watch TV now as I type. I have a weakness for Vampire Diaries, no thanks to my earlier obsession with Buffy the Vampire Slayer. Most of you are probably familiar with Cath from the Moxie Fab World Blog and Trends Editor for Paper Crafts Magazine (two of my favourite places to look for inspiration). Due to rotary cuff injury, Cath has been in a lot of pain lately and was unable to make her usual trek to CHA. To lift her spirits, bloggers Virginia and Lorena have organized a little blog hop of well wishes for Cath. Here is my card, which was inpired by a card by Julie Ebersole, AND the Winter Blossoms Tuesday Trigger that Cath posted. I made this at the shop to go with The Paperie’s new feature “One little stamp” – this week we’re featuring the Hero Arts Dandelion and I’ve pinned some other awesome ideas on our Pinterest Board. (I spy my all-time favourite Virginia Lu card on that board). I also used the Hero Arts Artistic Circles background stamp and a HA sentiment too. Cheers Cath! It’s been a long time since I played along with a Tuesday Trigger, but when I saw this image it conjured up all kinds of ideas. Although this isn’t the idea I originally had in my mind, I like how it turned out. 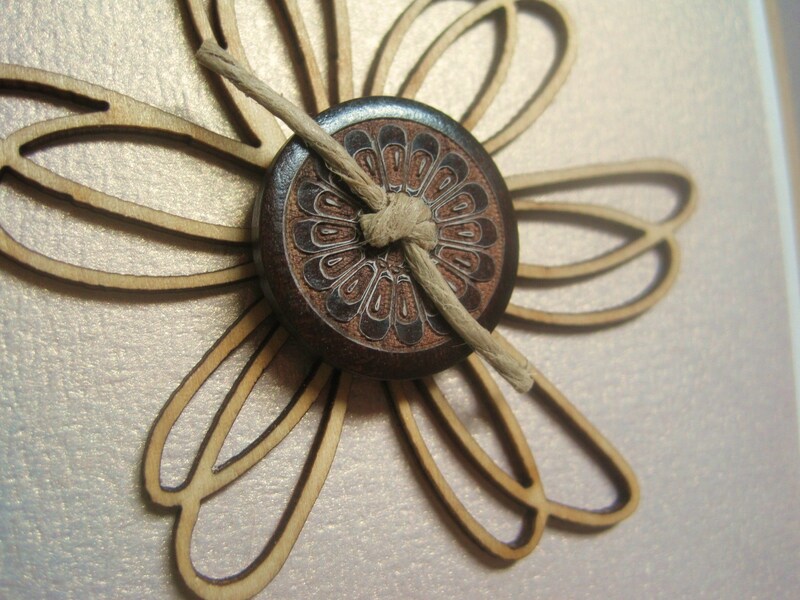 Here’s a close-up of that wooden button which was not easy to part with, I’m not going to lie. Love those KaiserCrafts wooden flowers too (both were parts of the December Paperie Club Kit). 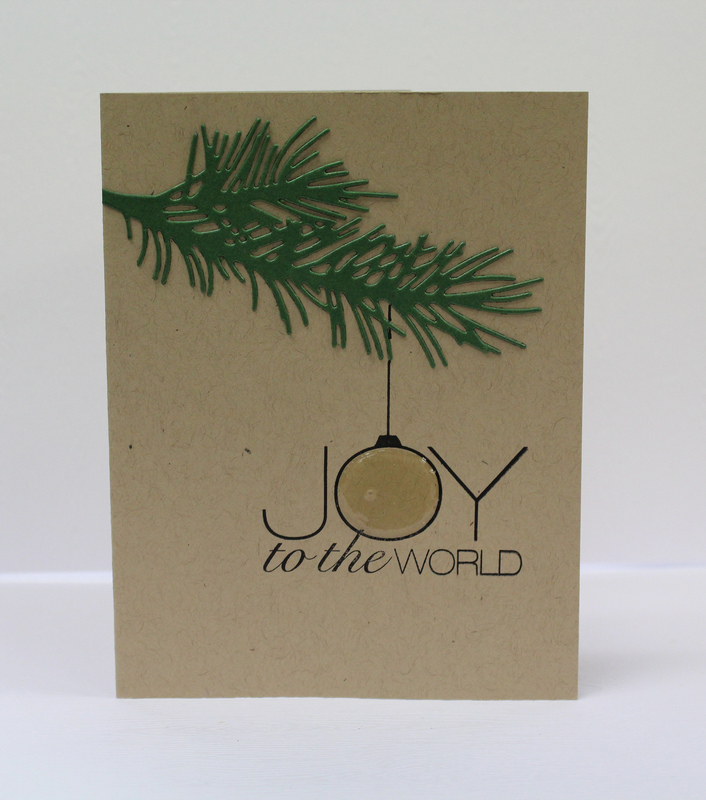 The shimmery Seashell paper is from Envelopments and it is my all-time favourite cardstock. SO much has happened since my last post that I don’t even know where to begin. I had to put a hold on my Awareness card collection due to an amazing turn of events. In late September there was talk on Facebook about a possible fundraiser for my friend Tiffany, maybe a gig or a cabaret. A week went by and nothing had been organized, so I emailed a couple of local bands and asked if they would be willing to play a Benefit for Tiff. So the next morning Jody emails me and tells me “The third band is Fur Packed Action. We have all agreed. ALL money goes to the cause.” I cried from joy, I could hardly believe such a selfless act. You see, Fur Packed Action, aside from being my *favourite* local band of ALL time, have been broken up since 2001. TEN YEARS. They have played only ONE reunion show since that time, five years ago in 2006. There was always something so special about an FPA show. I can’t even begin to tell you how many friendships I’ve forged through mutal love of this band. My best friend Jenni and I spent every other weekend at FPA shows. I met my other best friend Peggy at an FPA show. I instantly adored an old co-worker named Susy because she loved FPA – she is still my friend today. When I met my friend Heidi, we bonded over a mutual love of FPA. Deebs (Darryl) and I met at FPA shows and became fast friends, and he introduced me to other great pals who love FPA. Jody, the singer of FPA has become like a brother but better – he’s been there for me through every tough time in my adult life with just the right amount of perspective. Anyhow. Needless to say, I love that band a lot. Jody asked another old fave, Persona, to play the show as well and they all agreed. We announced the Benefit on Facebook on a Wednesday, the tickets were available the following Friday at 5pm and they were *totally* sold out by Saturday evening. Over 250 tickets sold in 24 hours. It became apparent we’d need to announce a second show, so that’s what we did and it looks as though that show is almost sold out too (tickets available at Fred’s Records until they sell out!). Talk about overwhelmed. I am so excited to see FPA again, but that excitement is matched by feelings of shock and joy, knowing that… I put this in motion. I didn’t ask FPA to play, I never would’ve been so presumptious, I just wanted to raise $1000 for a friend in need. As it happens, we have currently raised almost $10,000 for Tiffany so far. The bands are not just giving up their time for two nights, there will be countless hours of rehearsal for them all to relearn songs they haven’t played in 5 years. I just cannot begin to thank them enough. In other news, I decided to book a trip to Toronto on a whim, so I spent a week on the mainland visiting some friends and see a Canadian band called C’MON play their last two shows. October was certainly a whirlwind, and November is shaping up to be even crazier. Exciting times!